Chris Comstock, better known by his stage name Marshmello, was born on May 19, 1992. He is an American electronic dance music producer and DJ. He first gained international recognition by remixing songs by Jack Ü and Zedd, and later collaborated with artists including Omar LinX, Ookay, Jauz and Slushii. In January 2017, his song "Alone" appeared on the U.S. Billboard Hot 100 chart. Marshmello wears a custom helmet for public appearances. His identity was unknown, but was confirmed to be Chris Comstock in late 2017 by Forbes. Marshmello's stage name, an alternative spelling of "marshmallow", and his marshmallow mascot head were both inspired by Canadian electro house music producer and DJ deadmau5, who also notably uses an alternate spelling for his stage name and performs wearing a "dead mouse" mascot head. Acknowledgement of deadmau5's contribution to Marshmello's persona is evident in the music video for "Alone", which features Marshmello's pet mouse, Joel (deadmau5's real name). Marshmellow also referenced deadmau5 with a variant of his helmet (with a third ear) featured in the original edit of "Ritual"'s music video. This was removed at deadmau5's request. 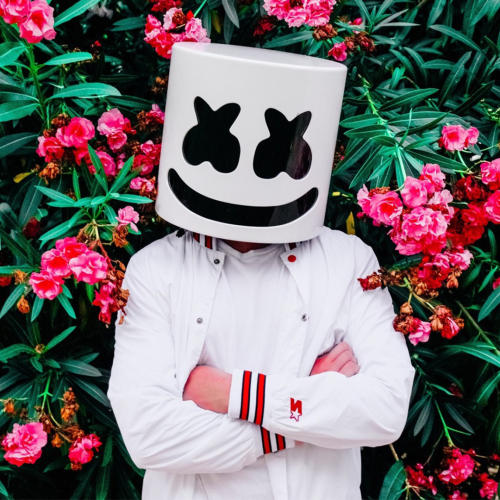 While Marshmello's initial identity was not initially confirmed, the most widespread speculation was that he is Chris Comstock, also known as Dotcom. The speculation was confirmed as true in 2017.